A Program Clock is a template that broadcast stations and networks use to program on-air: when to start and end a show, where to place breaks for local announcements and underwriting or ads, when newscasts should be inserted, etc. But you should consider using one for your podcast, even though you're not as bound by time constraints as traditional terrestrial radio and television programs are. 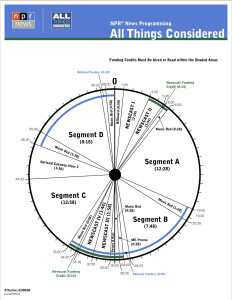 A Program clock brings a desirable consistency and predictability to your show's format, which is useful both to the producers, hosts, editors, and others involved in creating the show, but also to the audience, who'll take comfort in the organization and structure of the show from episode-to-episode. Creating a program clock is simply a matter of dividing a circle into time “wedges” representing each of the various components or “segments” of the show: Cold-Open, Intro Music, Welcome from Host, Ad/Promo/Call to Action, Content Blocks, wrap-up, and outro music will each be represented by a wedge with time indicators to show the start and end points. Other formats can be used. I've seen vertical bar-charts, horizontal timelines, and chronological run-down outlines. In the video production space, storyboards are an analogous tool. Following the program clock rigorously is something best left to broadcasters who have specific time windows in which they must fit their programming. In the podcast space, this is less of a concern. Audience members aren't going to mind if your show goes a few seconds (or minutes) longer than expected. The point is, you use the Program clock as a guide. It's ok to depart completely from your clock if the content justifies it. Breaking News or special event coverage is a perfect example. Announcing that you're doing so, is a great way to capture your audience's attention from time to time. Consider creating a show clock for your podcast. It's a valuable planning and production tool. Here are some articles about Program Clocks. As always, the Law Podcasting Podcast is brought to you by Power Podcasting for Lawyers, the only online podcast training built specifically for lawyers by lawyers.